Because this is such a great deal, other sales, promotions and incentives do not apply to this item - unless specifically noted. 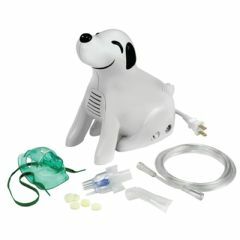 The Digger Dog Nebulizer is created to appeal to children of all ages. It is perfect for school, home or even soccer practice, Digger Dog will ease any child's fear or embarrassment of respiratory treatment. It is a fun way to give young children their medication in a fun way. Approximate Unit Weight: 3.5 lbs. Surprised that the mask was a hit. I was surprised that my daughter choose to use the mask. But she loves it. It makes the process easier on Mom too. She loves her dog! Mask is cheap, purchased . Great for home and travel. Know the answer? Be the first to share! Just wanted to drop you & Allegro Medical a line to say THANK YOU for your help with getting my battery for my wheelchair. Your help and service was very appreciated. I received the replacement battery when you said it would come. It is a pleasure doing business with such good service. I recently had a problem with a cast cover I ordered and Jeff in your Call Center helped me out a great deal. He was able to quickly pull my order, assess the situation and rectify the problem quickly so that my five year old can take a shower with ease and possible swim this summer!! Most importantly, it was how he handled himself - he was extremely personable, pleasant and so so helpful. Just thought I would pass this along-thought you would be pleased, I sure was!